Some sources claims that EA Sports have published a job listing for employees who would be hired to create Story Mode in FIFA 17. FIFA 17 Story Mode would be a perfect addition to the popular football simulation game. EA Sports FIFA modes are nice but there is always space for some developments. The last big addition was FIFA Ultimate team and it soon became the most played mode of the FIFA game. However, Story Mode would be even better addition to the mode. Although there is still no reliable confirmation that EA Sports are going to include Story Mode in FIFA 17, we collected some information proving that they are considering this option. A job listing appeared in official EA website for Gaming Cinematics Designer. The new employee will work closely with the Narrative Director, Cinematics Director, Art Directors, Producers and Senior Designers. So there is a possibility that Story Mode will appear with FIFA 17 in September. Still, we need to admit that this job offer might be just for replays, cutaways, new animations and celebrations. But we are quite sure that it will be for FIFA 17 Story Mode. NBA 2k and WWE 2k have Story Mode and EA supporters want this to be included in FIFA series also. 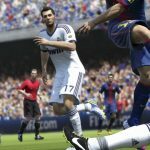 EA Sports Started Developing FIFA 17 a Long Time Ago?